Mazer II by E-3LUE in the latest stylistic and performance upgrade of iconic Type-R wireless gaming mouse. Now it is more polished and refined than ever before. Aircraft wing inspired the concept of Type-R's functional form which was ergonomically designed for right-handed gamers. Adopting pioneering 2.4Ghz wireless transmission technology the mouse provides stable wireless connection with no operational discrepancies. Interference resistant it is capable of receiving signals from the 30 feet radius of the Nano- receiver. This mouse allows you to submerge into the world of gaming with no limitations. Mazer II unleashed your inspiration. Take your gaming to another level with it. 4 Adjustable DPI Levels (500-1000-1800-2500), easily change the cursor sensitivity depending on your activity. No need any driver, plug and play directly. High battery Endurance: Multi-stage power saving mode, less power consumption. 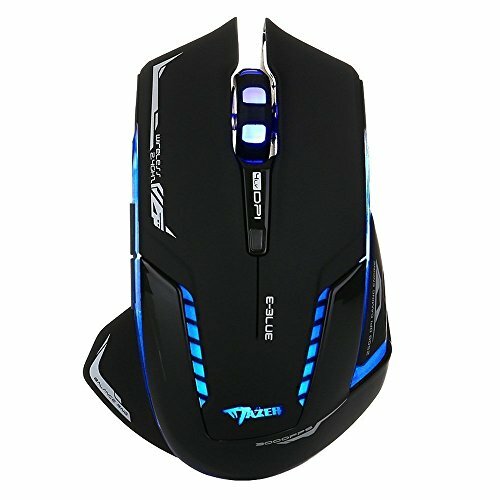 There is a button at the bottom of the mouse, three options: ON, OFF, ON/light.Put it at ON/light,the LED backlight will light up. Strong Durability and 33ft Long Working Distance. 500,0000 Times keystroke Test and perform well. 2.4GHz wireless technology, increased working distance of up to 33ft. If you have any questions about this product by E-3lue, contact us by completing and submitting the form below. If you are looking for a specif part number, please include it with your message.